In this interactive workshop, we’ll use excerpts from well-known cases to develop a more scientific approach to editing. In particular, we’ll focus on how to make work product more concise, how to restructure rambling paragraphs, and how to transition between sentences more effectively. We’ll also have an informal Q&A on common usage disputes. The program will focus on legal prose rather than on transactional drafting. Participants will also receive my Attorney Toolkit with custom models, checklists, and answers to the most common legal-writing questions. 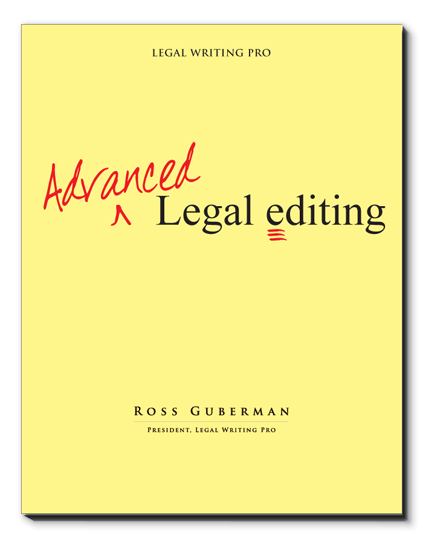 If you’d like to learn more about our Advanced Legal Editing program, please fill out the contact form below.